“Remember this name: sea buckthorn berries. It seems there’s some new miracle ingredient for skin emerging every week, but sea buckthorn berries really do deserve the hype surrounding them. You will be hearing a lot more about this superfruit in coming years, as the global cosmetics industry catches on to the incredible skin healing properties contained in these tiny power packs from the Himalayas. Sea buckthorn (Hippophae Rhamnoides) berries have been used for centuries in Asian medicine (Tibetan, Mongolian, Chinese) for the maintenance of beautiful, healthy skin. Their oil is incredibly rich in antioxidants, vitamin C, vitamin E, carotenoids and essential fatty acids. Not only do they contain the essential fatty acids of omega 3 and 6, but also omega 7(one of the rarest of the naturally occurring omegas and a key building block of healthy skin, hair and nails). In fact, sea buckthorn oil extract is 80-95 per cent essential fatty acid, so it’s extraordinarily rich. Sea buckthorn berries are packed with more than 190 bioactive compounds that revitalise skin, including vitamin A, B1, B2, B6, and amino acids such as leucine, isoleucine, valine, methionine, phenylalanine, and lysine. How do sea buckthorn berries help your skin? 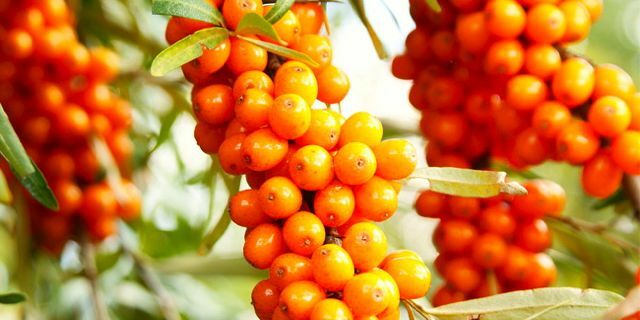 The super-rich vitamin, mineral and antioxidant qualities of sea buckthorn berries make them a miracle ingredient for skin healing and rejuvenation, and they have an exceptional anti-aging effect. Excellent little overview on the skin benefits of sea buckthorn oil! Please note that the seed oil and berry oil nutritional components are very different. Read more about these differences here. ← How Super is your Super Fruit?